There's a lot to consider. High dynamic range (HDR) TVs and projectors have been around for years now, but PC displays have been the neglected stepchild. It was only just last year that HDR monitors like Dell's UltraSharp 27 4K started to appear. Luckily, things changed for the better when VESA unveiled a new standard, DisplayHDR, which set a baseline for PC HDR displays. While a number of models conform to the standard, many others still don't but are nonetheless worthy of your consideration. HDR is a confusing subject, to say the least. On a basic level, it's a standard that improves monitor brightness, contrast and color range well beyond current displays. It has the potential to punch up movies, games and graphics in a way that's much more noticeable than the resolution boost offered by 4K. For TVs and projectors, consumers are mostly concerned with what kind of HDR their set supports, whether it be HDR 10, HDR 10+ or Dolby Vision (that's another discussion). Dolby Vision is currently the king of those standards, as it allows scenes in films and TV shows to be played back as the creators intended. Regardless of which type of HDR TV you choose, though, you can be sure it meets minimum standards for contrast, color gamut and bit depth input (10 bits). TVs that meet the UHD Alliance (models from Hisense, Samsung and LG, so far) are guaranteed to output at least 1,000 nits of peak brightness. However, PC monitors support HDR 10 only, and most can't reach the required 1,000 nits of brightness, so other features and specifications are more important. Until late last year, there was no set baseline for HDR TVs, other than that they need to be bright, high-contrast and color-rich. Luckily, that all changed when VESA unveiled the DisplayHDR standard. 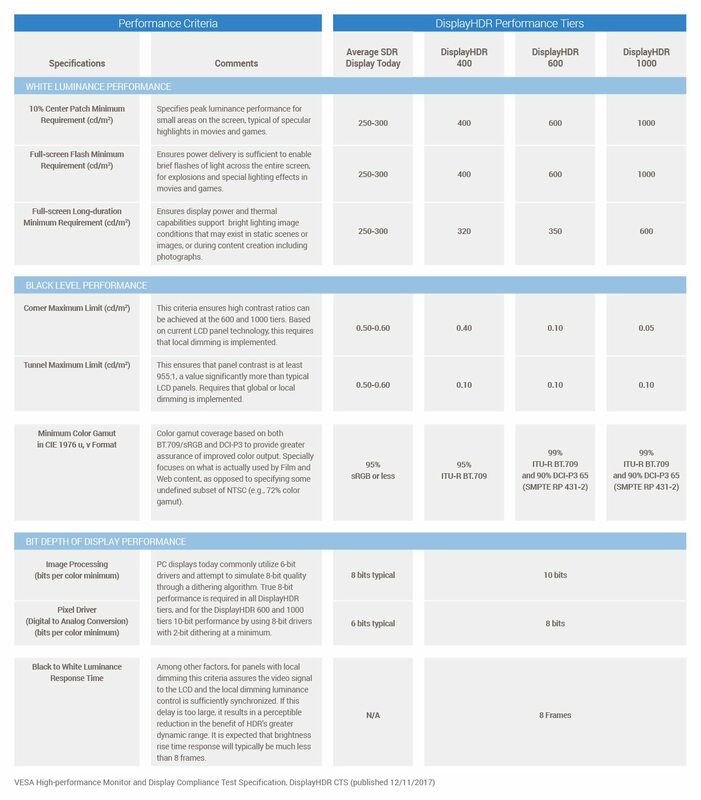 There are three certification levels -- DisplayHDR 400, 600 and 1000 -- with the number referring to the maximum brightness level in nits. Conforming screens must hit those levels, which are much higher than those of most displays put out today, while meeting other goals for color gamut, bit depth and black levels (contrast). The standard isn't easy to meet, judging by the fact that only nine displays currently qualify, and only one (the Philips Momentum 436M6) hits the DisplayHDR 1000 mark, making it one of the brightest displays or TVs you can buy, period. The standard isn't as strict as it could be, though. While it calls for 10-bit color processing, the panel itself can support lower 8-bit FRC color depths at a minimum (16.7 million colors, plus 2-bits of "dithering" to simulate 1 billion colors). HDR monitors, measured by square inch, are significantly more costly than the average HDR TV. Why is that? 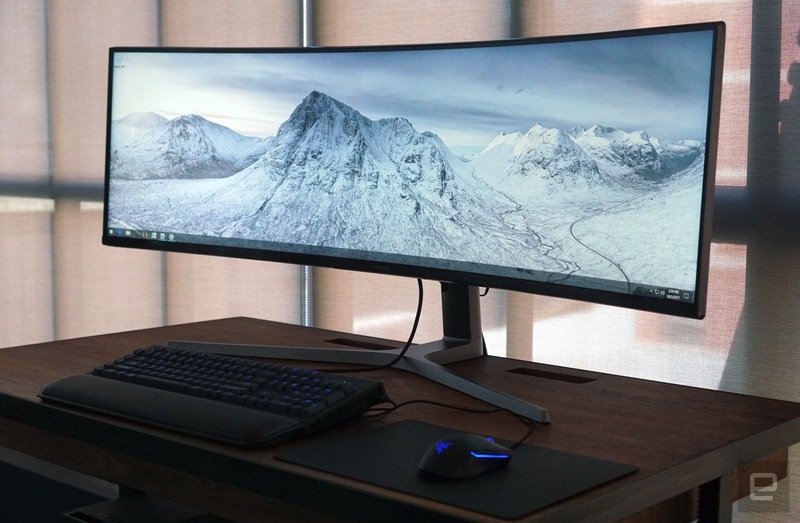 For one thing, most high-end computer monitors use costly IPS panels, rather than the VA (vertically aligned) QLED or OLED panels used on most TVs. Many IPS panels have contrast below the levels needed to qualify for the DisplayHDR standard (955:1). That's because they're made to look great with the lights on -- which they generally do -- but in the dark, the inferior contrast levels are more obvious. At the same time, just because a display can't meet the DisplayHDR standard doesn't mean it isn't suitable for your needs. BenQ's SW320, for instance, conforms to the color and contrast requirements of DisplayHDR but falls short of the brightness requirements. It's still a good choice, though, if you're into graphics. Another problem with HDR on PCs is Windows 10 itself. Up until recently, you had to enable HDR in the display settings, then disable it when you're done looking at your HDR movie or game. That made any HDR-enabled content pop, but regular content (SDR), looked bad, to say the least. Once you've purchased an HDR monitor, you're of course going to need HDR content for it, too. Other than HDR Blu-ray discs and Netflix and Amazon Prime Video, which have offered HDR 10 content for a while now, it's surprisingly difficult to find elsewhere. HDR YouTube videos are still few and far between, but you can find some to start with on the HDR Channel. As for games, it's much easier to find HDR console games for the Sony PlayStation 4 and Xbox One. There are a few dozen that support HDR for the PC, though, according to PC Gaming Wiki. Notable ones include Destiny 2, Far Cry 5, Battlefield 1, Assassin's Creed Origins, Star Wars Battlefront II, Resident Evil 7: Biohazard and Call of Duty: WWII. 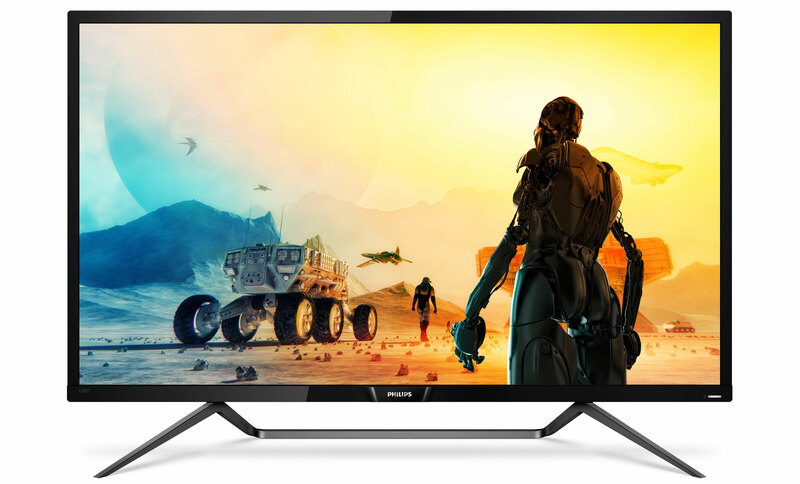 While HDR TVs are meant to show movies and films to entertain you, you might want an HDR monitor for graphics work, gaming, entertainment or all of the above. So let's take a look at the top HDR displays and examine their strengths, weaknesses and, most important, price points, so you can find the model that's best for you. As with other gaming displays, HDR monitors are divided into AMD and NVIDIA camps. To get NVIDIA's G-Sync HDR nod, a monitor must peak out at a full 1,000 nits. So far, however, no G-Sync HDR monitors have come to market, though several have been announced (we'll mention those in a moment). Keep in mind, though, that AMD FreeSync 2 monitors don't have a brightness requirement for HDR, and many have been on the market for about a year. Several DisplayHDR monitors aimed at gaming are also available. A few other models lacking the DisplayHDR certification could also do the job. 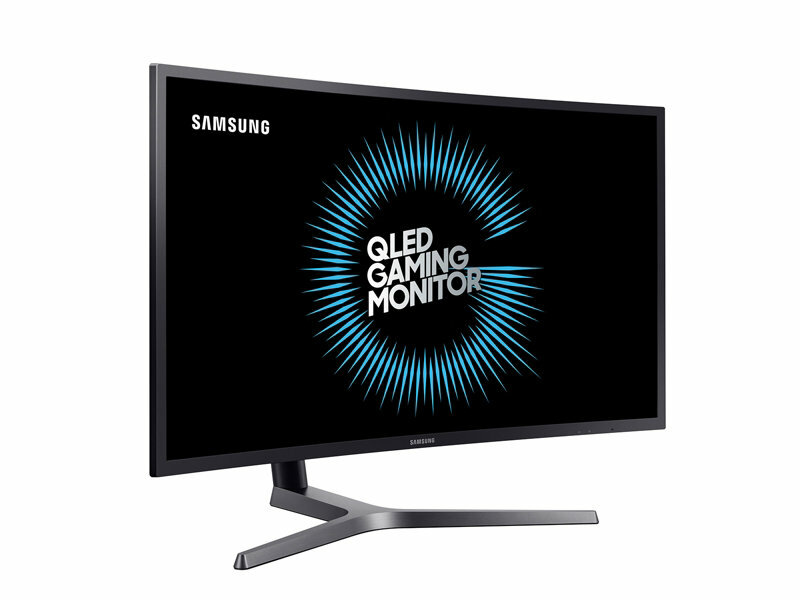 Not surprisingly, Samsung uses its own QLED (quantum dot) tech for its 32-inch, 2,560 x 1,440 curved CHG70 monitor. That's the same type of panel the company uses on its 4K HDR TVs, so it brings many of the same advantages to PC gamers and movie watchers. It's incredibly bright, being certified to the DisplayHDR 600 standard, it delivers a billion shades of color (10-bit), it supports AMD Radeon FreeSync 2 with a 144Hz refresh rate and it offers a 3,000:1 contrast ratio. The CHG70 also has a design that pushes the screen three inches closer to your face than most models, which is ideal for gaming. At this point, for $650, the CHG70 is the best HDR gaming monitor you can buy. 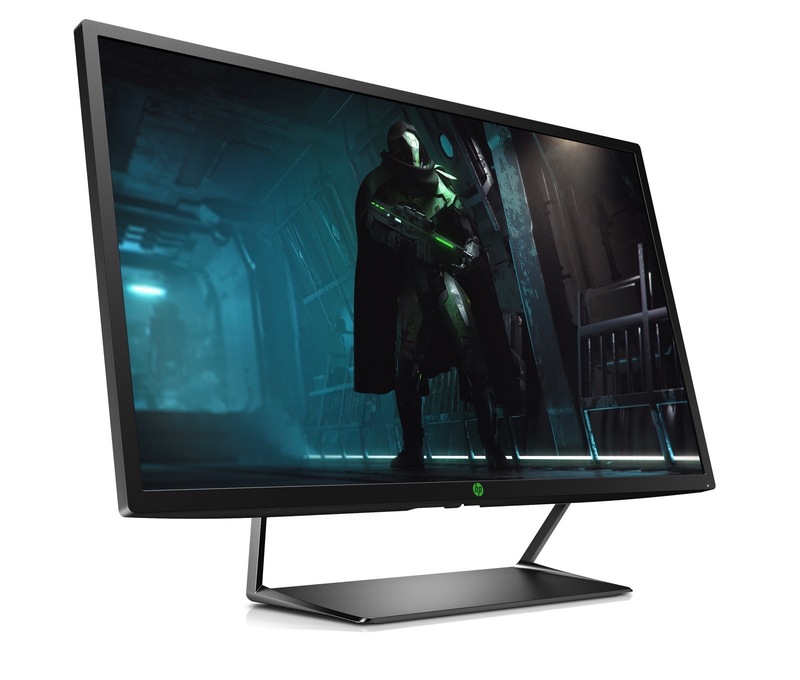 If you're looking for a large, bright, relatively cheap HDR gaming monitor with decent refresh times and AMD FreeSync compatibility, check out HP's 2,560 x 1,440 Pavilion Gaming 32 HDR Display. It uses VA, rather than IPS tech, allowing it to meet the DisplayHDR 600 standard with 600 nits of brightness, a 3,000:1 contrast ratio, 95 percent DCI-P3 gamut and a true 10-bit color depth (1 billion colors). The 75Hz refresh rate is mediocre, but it does have a snappy 5ms latency. The best part is maybe the price: At $449, it's a relative bargain for an HDR monitor of any kind. AOC's 2,560 x 1,440 AGON AG322QC4 is another certified VESA display, at a lower DisplayHDR 400 level. While it's the same size and resolution as HP's model, and also uses VA rather than IPS tech, it's aimed at a slightly different buyer. To wit, you get lower brightness (400 nits max), contrast (2,000:1) and color bit depth (8 bits, or 16.7 million colors). However, you do get a stellar 144Hz refresh rate, support for AMD's FreeSync 2 with variable refresh rate, gaming-specific HDR with lower lag and four milliseconds of latency. So, yes, this is for gaming performance, rather than color aficionados. It's coming to Europe next month for €599, and should arrive in the US a bit later, for a bit more. 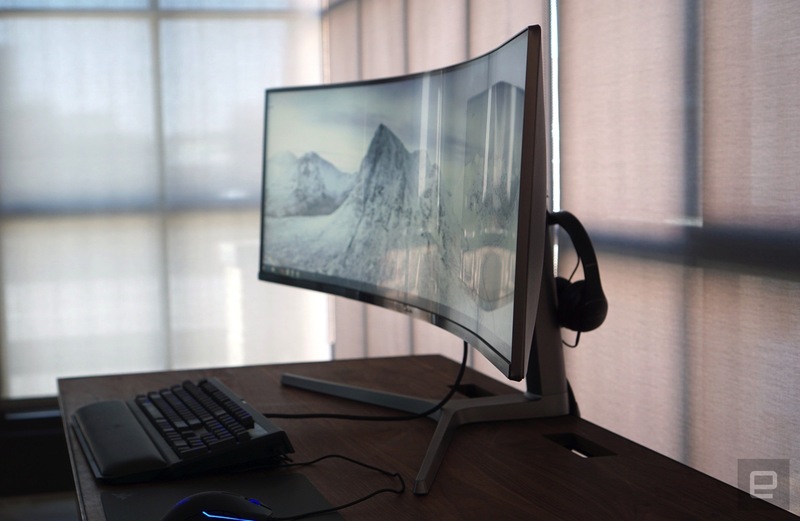 Samsung's CHG90 is an odd beast. It meets the DisplayHDR 600 standard and, thanks to Samsung's QLED tech, displays a billion colors (10-bit), and has a 144Hz refresh rate and 3,000:1 contrast ratio. However, it has a very unusual 3,840 x 1,080 resolution, which yields an extremely wide 32:9 aspect ratio. It's essentially two 1080p monitors welded together, making it look almost comically wide. If you're into gaming, though, and have $1,000, it's worth a look. In his hands-on test, Engadget editor Devindra Hardawar found it was fast, with realistic colors and bright HDR elements "that popped off the screen." 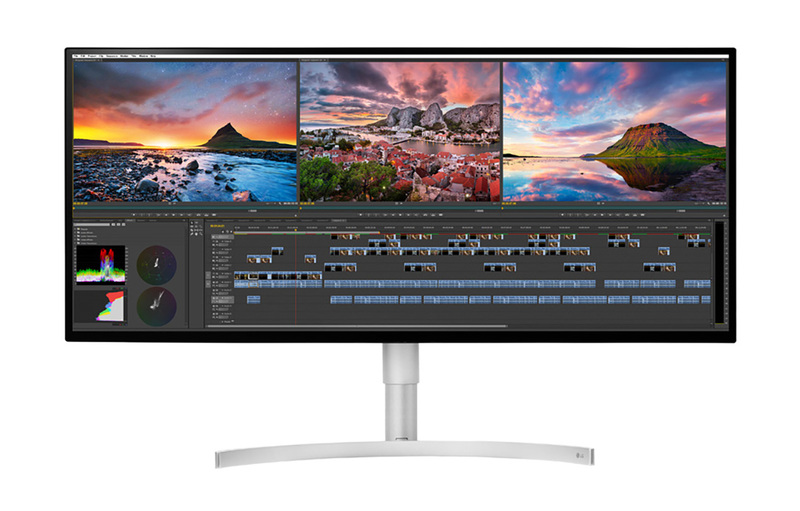 He was also "impressed by how immersive the monitor felt," adding that "it could be very useful for content creators who need to work in timeline-focused apps for video and audio editing." You'll soon see a pair of G-Sync HDR monitors from both ASUS and Acer, likely starting with Acer's 4K Predator X27. 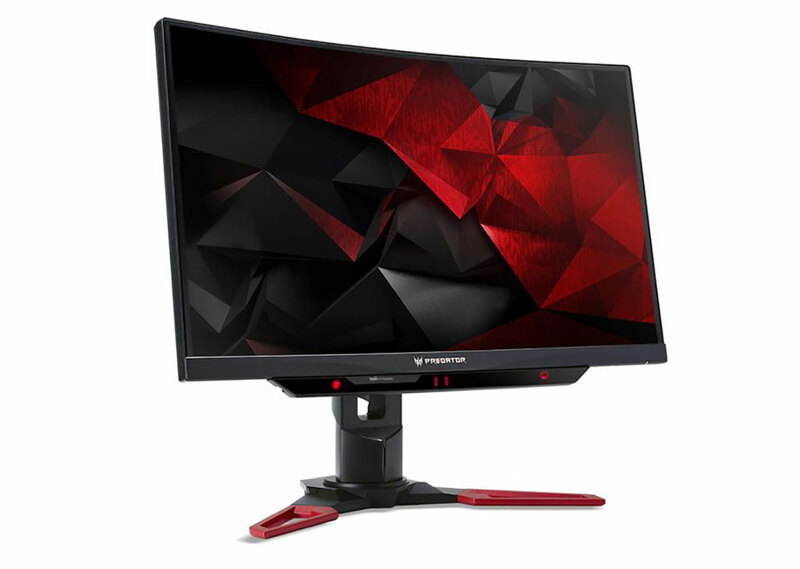 Other models include the 4K ASUS ROG Swift PG27UQ and a pair of 3,440 x 2,160, 35-inch curved screens: the Acer Predator X35 and ASUS ROG Swift PG35VQ. The much-delayed displays will use an NVIDIA reference design and feature a direct LED backlighting system with 384 zones, 1,000 nits of peak brightness, 144Hz refresh rate, 10-bit color depth and HDR10 with a DCI-P3 color gamut. Those monitors should meet the DisplayHDR 1000 standard when they arrive, if manufacturers choose to have them certified. To say the least, 1,000 nits of brightness is a lot to have so close to your face, and testers have reported that explosions and other gaming visuals are almost too bright. Still, these monitors match the specs for HDR TVs, and if you want the best gaming option possible, you might want to wait for them to arrive. LG is also set to release the 34GK950G, a 34-inch Nano IPS display with 3,440 x 1,440 ultrawide QHD resolution, 120Hz refresh rate, NVIDIA G-Sync support and 98 percent DCI-P3 color gamut. It's expected to meet the DisplayHDR 600 certification, but not NVIDIA's G-Sync HDR certification. Most folks watch movies on their TV and not their computer monitor. But a fair number of people, especially cord cutters, probably use a single monitor (preferably a fairly large one) for gaming, entertainment and computing alike. Manufacturers have thought of those folks, creating HDR monitors that can handle Netflix, PC or console games and regular computing chores. At 43 inches, Philips' 4K 43-inch 4K Momentum is television-size and, as the first certified DisplayHDR 1000 monitor, it's also as bright as an HDR TV. It does 10-bit image processing (but the panel bit depth is 8-bit + FRC), it can handle 97.6 percent of the DCI-P3 color space necessary for HDR and it packs a decent 80Hz refresh rate and four-millisecond latency. It's perfect for watching movies and doing double duty as a console or PC gaming screen, thanks to the MultiView technology that lets you watch, say, live TV on one side while gaming on the other. Oh, and it has Philips Ambiglow tech, which puts a halo of light around the screen that matches onscreen content. It costs $1,000, a decent price for a monitor of that size, and will go on sale later this summer. 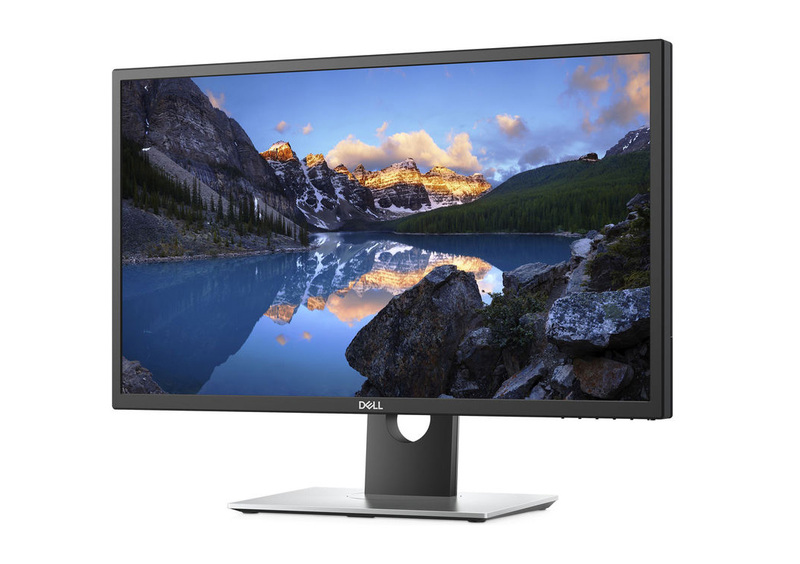 Dell's 27-inch, 2,560 x 1,440 Ultrathin S2719DM IPS monitor offers HDR performance on a budget. It conforms to the DisplayHDR 400 spec, even though it actually pumps out 600 nits of peak brightness, because the 85 percent DCI-P3 performance doesn't quite meet the DisplayHDR 600 spec. Bit depth is limited to 8-bit (16.7 million colors), contrast is 1,000:1 and the maximum refresh rate is 60Hz. So this is a good monitor for HDR movies and doing graphics chores, particularly HDR video work -- at the bargain price of $350. Graphics HDR monitors are a different animal than the gaming and entertainment variety, as they must offer accurate color reproduction, on top of a wide color gamut and 10-bit depth for HDR. IPS panels still do that best, but you'll pay a pretty penny, typically well over $1,000 for 27-inch or larger screens. While most folks will use them to edit videos or photos, most models will play HDR10 movies and HDR games just fine, and you can be sure that the color reproduction will be spot-on. Dell's UltraSharp 27 4K monitor (the (UP2718Q) might be the ultimate HDR monitor, but you will pay for that privilege. It has a 10-bit IPS panel that can display 1.07 billion colors and supports 97.7 percent DCI-P3 coverage and 76.9 percent of the REC 2020 color space -- a wide color gamut for HDR. Colors are factory-calibrated, and incredibly accurate out of the box. Thanks to the 384 discrete LED lighting zones, it can hit a peak 1,000-nit brightness, packs a 1,000:1 contrast ratio and even has a decent 6-millisecond response time. This monitor will serve you for serious graphics chores, HDR10 movie watching from Netflix or Amazon Prime Video and even some gaming action. Again, the catch is the price: It's priced at $1,999, but Dell is currently offering it for "just" $1,480. 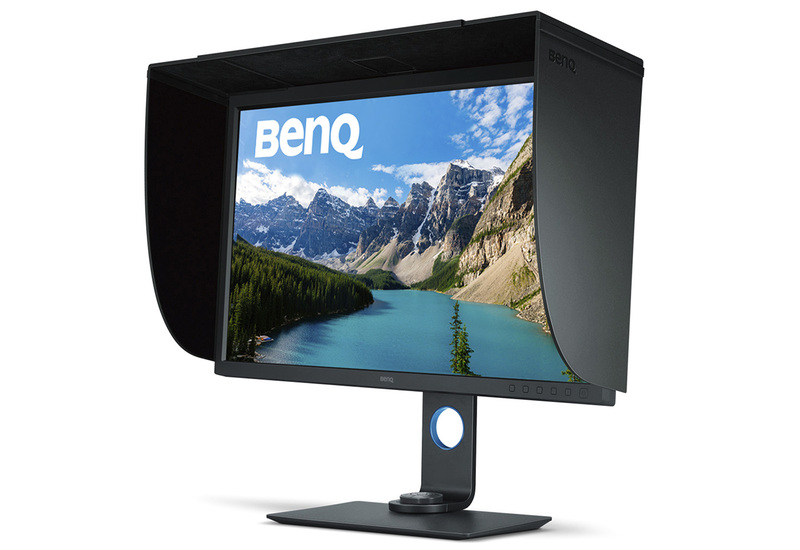 If you want a bigger but less bright HDR monitor, check out Benq's 31.5-inch SW320. It's also an IPS display but lacks the multiple LEDs, limiting it to 350 nits of brightness. It does have a true 10-bit display that supports a billion colors, along with a decent five-millisecond response time. It's calibrated out of box for extreme color accuracy and is Technicolor-certified for Hollywood-level specs. As such, it should serve as a good graphics and video-editing monitor while letting you watch HDR10 movies and do some light gaming. For a professional graphics monitor with HDR under a grand, the 32-inch, 4K Viewsonic VP3268 is one of the few options out there. Like the others, it has factory-calibrated color settings and 14-bit processing, though the panel itself is only 8-bit and supports 10 bits through FRC (frame rate control). You get HDR10 support for movies or graphics chores, but the monitor can output only a peak 350 nits, so it doesn't even meet the first tier of DisplayHDR. 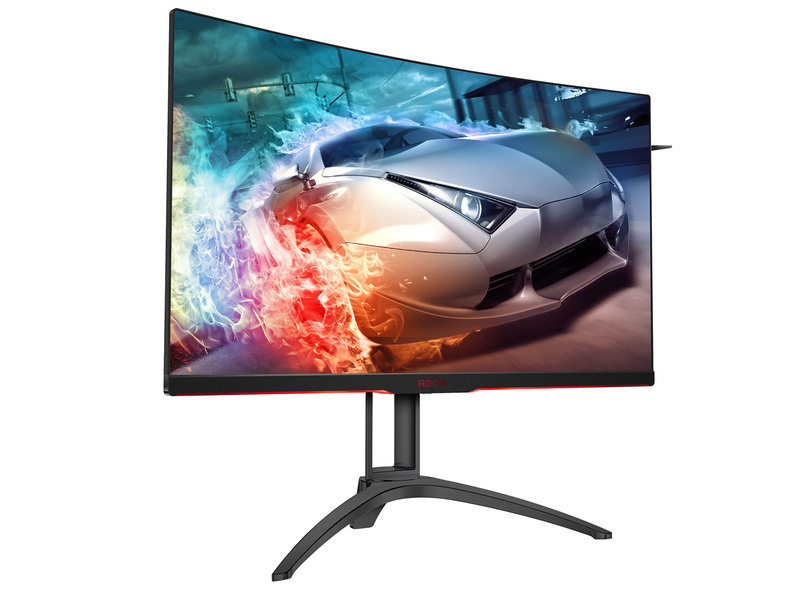 It's not really worth the $900 price if you're just into gaming, as it supports just a 75Hz refresh rate and features a slow 14-millisecond response time. But if you want it for professional graphics and occasional movie watching, it's actually a bargain compared with other HDR displays. LG has promised that both its new Nano IPS-powered displays for designers and photos editors will meet the DisplayHDR 600 certification. The 34-inch 34WK95U offers an ultrawide 5,120 x 2,160 resolution, while the 32UK950 packs 4K resolution. Both promise a 98 percent DCI-P3 color space coverage and are likely to have true 10-bit panels. Both are limited to 60Hz and are therefore not suitable for serious gaming -- for that, LG has the incoming 34GK950G (see above). You can simplify your life considerably by thinking about what you're using it for, and then looking at VESA's guide for certified DisplayHDR displays. If possible, it's not a bad idea to get a look at your preferred models before you buy. If you've purchased one of the above monitors, or are thinking about it, we'd be curious to hear your comments and questions below. After this article was published, Engadget received a note from DisplayHDR Chairman Roland Wooster with some corrections and interesting insights that have been incorporated into the article. It has also been updated to note that the latest version of Windows 10, RS4, provides better support for a mix of HDR and SDR, provided you have a monitor that supports HDR. 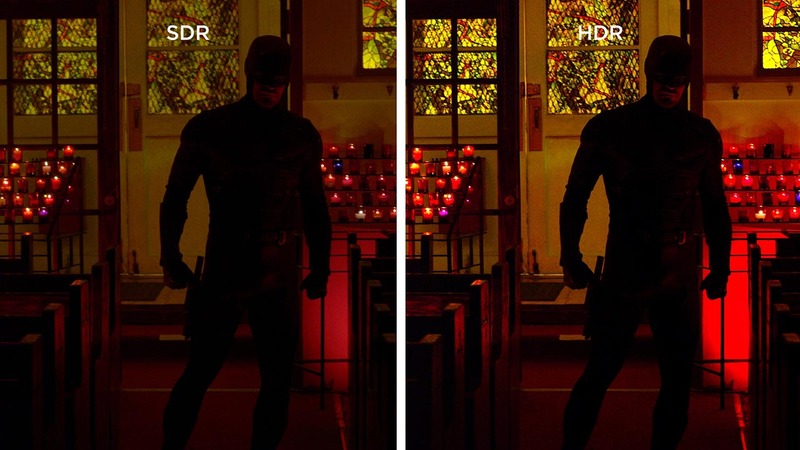 One of Wooster's main points is that the HDR 10 standard and others, including Dolby Vision, don't require specific brightness levels (1,000 nits for HDR 10 and higher for Dolby Vision) as the article stated, but merely aim for it. By contrast, the VESA DisplayHDR 1000 standard does require a peak 1,000 nit level. "You might like to note that no television, to my knowledge, meets the VESA DisplayHDR 1000 standard." said Wooster. "One of the requirements that we require is a full-screen flash at 1000 nits for two seconds. I have not yet measured any TV to achieve this performance level." In other words, the Philips 4K Momentum 43-inch set might be the brightest display, TV or otherwise, on the market. It also shows that we're far from the ultimate goal of 10,000 nit HDR displays, only seen so far on Sony's CES 2018 concept X1 8K model. Wooster also pointed out that HDR 10 and other standards don't actually require true 10-bit panels like the article originally asserted. "All of the VESA DIsplayHDR, UHD Alliance, and HDR 10 specs require 10-bit input. And in fact only VESA actually specifies panel bit depth requirements," he said. "The VESA requirement is 8+2, which is also what the majority of 4K/HDR TV's use too. The heavy majority of '10-bit' displays are actually 8+2." It might not be easy for you to figure out whether or not your panel is 8-bit + FRC or true 10-bit, other than by the price (most true 10-bit TVs and especially monitors are more expensive). It would be helpful if manufacturers were more transparent about these details, or course. It also shows the need for new or refined specifications from the various standards groups and manufacturers so that consumers can make more informed buying decisions.